Online (Computer Based Test) and Offline (Paper Based Test). Divided into 5 sections each of which has 40 questions. Language Comprehension, Mathematical Skills, Data Analysis, Reasoning, Indian and Global Environment. 1 mark is given for each correct response and ¼ marks deducted for each incorrect answer. Exam Mode: The MAT 2019 exam paper is available both in offline and online mode. The time duration for both is the same. Total Questions: The MAT 2019 question paper totally consists of 200 questions. Sections: The MAT 2019 exam paper has 5 sections/subjects. Each section has got 40 questions that weigh 40 marks with each question being awarded 1 mark. MAT 2019 Marking Scheme: For every correct answer 1 mark will be awarded to the candidate, and for every wrong answer 1/4 marks will be deducted. Subjects Included: Language Comprehension, Mathematical Skills, Data Analysis, Reasoning, Indian and Global Environment. General Awareness: Mat 2019 exam includes the section called for General Awareness. Exam Duration: MAT 2019 exam duration is of 2 hours and 30 minutes i.e. total of 150 minutes. MAT 2019 mock test: Candidates must take the mock tests in order to be familiar with exam pattern. They must also go through the MAT 2019 model paper which will help them to measure their knowledge. The data analysis and sufficiency section judge a candidate on his critical thinking. This section carries 40 questions that require intense calculation. The amount of time advised spending on this section is 35 minutes. The Language Comprehension section in MAT 2019 will test a candidate on his comprehensive and reading skills. It will include reading the given passage and answering questions related to the same. This section has 40 questions. Candidates are advised to devote a maximum of 30 minutes to this section. The Intelligence & Critical Reasoning paper in MAT 2019 will test the logical and critical reasoning of all the candidates. Apart from that, this section forces the candidate to exert their mental capabilities to the maximum and that is the challenging part. The maximum time suggested attempting this section is 30 minutes. The Mathematical Skills paper tests a candidate’s oral calculation skills. Maximum time to be invested in the section should be 40 minutes. The Indian and Global Environment section in MAT 2019 evaluates a candidate on his knowledge of current affairs and past events. There are 40 questions in this section from politics, history, science etc. The suggested time to invest in the section is 15 minutes. The MAT exam consists of 200 questions and has a duration of 2 hours 30 minutes (150 minutes). The MAT exam is divided into five sections each of which have 40 questions each. The MAT question paper consists of five sections that have questions belonging to language comprehension, mathematical skills, data analysis, reasoning, and the indian and global environment. How is the MAT exam structured or patterned? 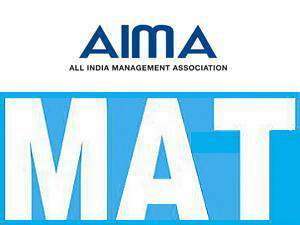 What is the marking pattern for MAT exam? The MAT exam is divided into five sections each of which have 40 questions each and 1 mark is given for each correct answer and ¼ marks deducted for each incorrect answer. What is the exam duration for MAT ? Will there be any negative marking in the MAT 2017 exam? Yes, 1/4th mark will be deducted for every wrong answer. What is duration of the MAT exam? The MAT exam is for a duration of 2 hours 30 minutes (150 minutes). How many questions are there in Mathematical Skills section? A total of 40 questions are there in mathematical skill section of MAT. How many questions are asked in the MAT exam? There are around 200 MCQs in the MAT exam which needs to be finished in 150 mins. What is the exam pattern for MAT 2017? The MAT exam consists of 200 questions and has a duration of 2 hours 30 minutes. The MAT question paper consists of five sections that have questions belonging to language comprehension, mathematical skills, data analysis, reasoning, and India and global environment.